Here in Portland, OR, one of the largest hand-painted murals in the United States is being dedicated tomorrow—and it’s on the side of a mausoleum—in my neighborhood! The 50,000 square foot hand-painted wildlife mural on the side of Wilhelm’s Portland Memorial Funeral Home is being dedicated tomorrow, Friday, October 2 and will include a rooftop tour as part of the ceremonies. 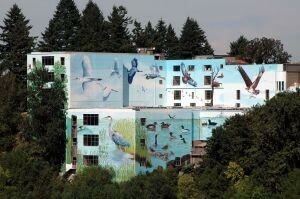 On Saturday, October 3, the Audubon Society of Portland will lead a hike through Oaks Bottom Wildlife Refuge for an up-close look at the mural. Details in The Oregonian here. For more information about Wilhelm’s Portland Memorial Funeral Home, check out this past Death Reference Desk post. Posted by Kim in Death + Art / Architecture, Monuments + Memorials and tagged funeral homes, public art. Bookmark the permalink.